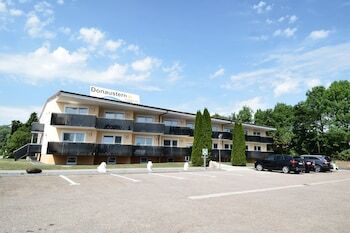 With a stay at Aparthotel Donaustern in Asbach-Baeumenheim, you'll be 18.1 mi (29.1 km) from Wemding Marktrplatz and 23.9 mi (38.5 km) from Gailach Spring. Free self parking is available onsite. A stay at Hermann's Neue Post places you in the heart of Calw, within a 10-minute walk of Hermann-Hesse-Museum and Kinostar Theater. Free self parking is available onsite. With a stay at Haus Am Kurpark Hotel Garni in Schoemberg, you'll be within a 5-minute walk of Ehemaliges Buehler'sches Haus and Schoemberg Church. Free self parking is available onsite. With a stay at Hotel Hennies in Sehnde, you'll be within a 15-minute drive of Expo Museum and TUI Arena. Free self parking is available onsite.